Gatwick Express must no longer claim it runs "non-stop to Victoria station in half an hour" and "in just 30 minutes" unless it can achieve the time in most cases, a watchdog has ruled. 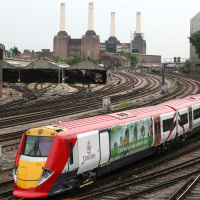 The Advertising Standards Authority (ASA) ruled the claims were misleading customers after it found that 20.1% of Gatwick Express trains between London Victoria and Gatwick Airport were delayed between April 30 and May 26, with the majority due to reasons within the operator's control. It followed two complaints that a poster and website for the service, seen in March and featuring the claim that the journey took 30 minutes, were misleading. Govia Thameslink Railway, trading as Gatwick Express, said a total of 79.1% of scheduled trains between Victoria and Gatwick arrived at their final destination on time between April 30 and May 26. It listed three unforeseeable exceptions to the planned services - if access was required for engineering work, if there was a failure with infrastructure such as signalling or points, or if there was an unavoidable incident such as a passenger falling ill - and said they were contractually obliged to adjust services for safety reasons such as speed restrictions. It also argued that it was difficult to mitigate against certain causes of delays such as staff sickness, and said any driver involved in an operational incident had to take a set amount of time off work. The ASA said consumers would expect Gatwick Express to achieve the stated journey time barring exceptional or unforeseeable circumstances outside their control. It said: "Whilst we acknowledged that a proportion of services were delayed due to exceptional or unforeseeable circumstances outside of Gatwick Express's control, such as track faults, fatalities and power supply failures, we considered that a significant proportion of services were delayed for reasons that were within Gatwick Express's control. "As such, we concluded that the claims 'Non-stop to Victoria station in half an hour' and 'in just 30 minutes' had not been substantiated and were misleading." It ruled that the ads must not appear again, adding: "We told Gatwick Express to remove the claims 'Non-stop to Victoria station in half an hour' and 'in just 30 minutes' unless they could achieve that journey time in most cases, save for exceptional and unforeseeable circumstances outside of Gatwick Express's control. Gatwick Express is part of the Govia Thameslink Railway franchise, which also includes Southern, Thameslink and Great Northern. The operator has suffered major disruption on certain routes in recent years caused by a number of factors, including industrial disputes, a shortage of drivers, infrastructure failures and the introduction of new timetables on May 20. A Gatwick Express spokesman said: "Just a third of Gatwick Express delay minutes were within our control, however we acknowledge the ASA ruling and began withdrawing these adverts many months ago." Frequent travellers abroad should invest in an Annual or Multi-Trip travel insurance policy from World First to stay covered all year round.